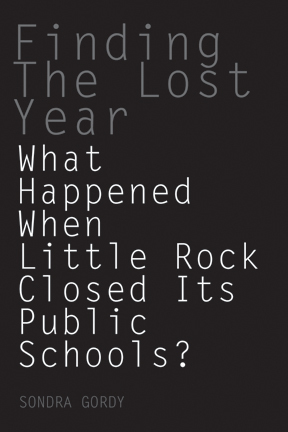 Finding the Lost Year: What Happened When Little Rock Closed its Public Schools? During the Little Rock School crisis, the governor of the state closed the public schools for a year. Although much has been written about the crisis itself, little has been published on the lost year when the schools were closed to students, both black and white. Finding the Lost Year is the first book to examine how a desegregation crisis turned into a community crisis. In Little Rock in 1958, 3,665 students were locked out of a free public education. Teachers’ lives were disrupted. Students were scattered to schools outside the city, some left the state, some joined the military and others took correspondence courses. But fully half the black students went without schooling that year. Author Sondra Gordy draws on personal interviews with more than 60 former teachers and students, detailing the long-term consequences for students affected by events and circumstances that were out of their control. Gordy, a history professor at the University of Central Arkansas, also has produced a documentary on the topic, which can be ordered at thelostyear.com.